Donkey Kong's addition to Mario + Rabbids was hinted at early on with the promise that the DLC packs for the game would include weapons (delivered at launch with the "Pixel Pack" and "Steampunk Pack"), new challenges (delivered last October with the "Ultra Challenge Pack"), and "new story content." It appears Donkey Kong's arrival will be the aforementioned story content as not only will he be a playable character, but a new single-player story mission will be added to the game as well. 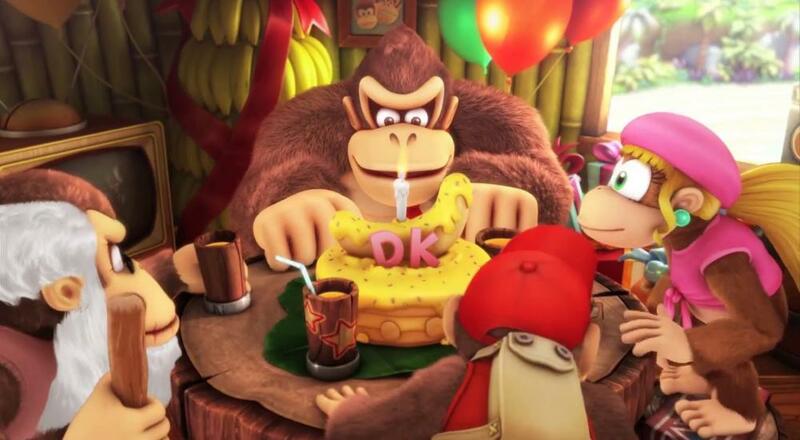 While it's a shame you won't be able to play that mission with a buddy, at least you'll still be able to enjoy using Donkey Kong himself in the separate co-op missions. If that's not enough Donkey Kong for you, then the good news is that you won't have too long to wait until you'll have the chance to enjoy a full-fledged DK title. Donkey Kong Country: Tropical Freeze is getting the remaster/port treatment and will be landing on the Switch May 8, 2018. Originally a Wii U title, the game will still support two player couch co-op allowing you and a buddy to play as Diddy, Dixie, Kranky, and Donkey Kong. Each of the Kong Krew has their own unique abilities and the second player can always hop on the first player's back when needed if particular sections prove to be a little too daunting for both players to attempt. This version of the game will also include a new character/mode: Funky Kong. Funky Kong has a lot of special abilities, like being able to infinitely roll, float in the air, and ignore spikes, that makes the game significantly easier, which is perfect if you want to play with buddy that may not feel too comfortable with platformers just yet. We were fans of the title back in 2014, so this sounds like a great opportunity for all those Switch owners out there to play a great platforming title. No release date was given for the Donkey Kong DLC for Mario + Rabbids Kingdom Battle, but it should be out sometime Spring 2018. Donkey Kong Country: Tropical Freeze is slated for a May 8 release date on the Nintendo Switch. Page created in 0.3839 seconds.